Chanel Sycamore is a member of the Chanel Les Exclusifs line where the fragrance house tends to get a bit artsier than their mainstream releases. In Bottle: Sycamore is vetiver, first and moremost. This dewy kind of vetiver instead of the dry grass that I usually get. It’s also a bit woodsy and smoky at the same time. Applied: The vetiver comes up first and is joined shortly by sandalwood and tobacco. There’s a bit of powder and clean in this as well and a wet sort of smoky scent. This reminds me of my childhood and the smell of woodsmoke after a rainstorm. It’s a bit more perfumy than the memory I have of actual rain and woodsmoke but it is a very nice approximate and a very close concept. It takes me back to simpler times and I really like that. The fragrance itself is a vetiver centric scent with perfumed sandalwood, a bit of smoke with a moist, dewy personality. Very nicely done. I get fantastic longevity with this stuff. 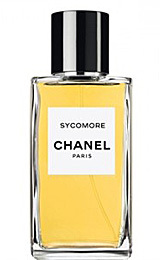 Extra: Sycomore was a combined brain child from Christopher Sheldrake (Ambre Sultan from Serge Lutens and Daim Blond also from Serge Lutens) and Jacques Polge (Chanel’s Chance and Egoiste). Design: Designed the same way as other members in Chanel’s Les Exclusifs line. A big glass rectangle with a simple label. It’s at recognizable as an elegant, simple, Chanel design. Also it has a magnetic cap so I’m sold. Notes: Vetiver, sandalwood, aldehydes, tobacco, violet. If the memories keep rolling in when I wear Sycomore, it might be large bottle worthy. All of the Les Exclusifs seem to be big hits with me and Sycomore, so far, is the biggest hit due to the memories it stirs up. Reviewed in This Post: Sycomore, 2010, Eau de Toilette. This entry was posted in chanel, Reviews By House, woodsy and tagged aldehydes, sandalwood, tobacco, vetiver, violet. Bookmark the permalink.